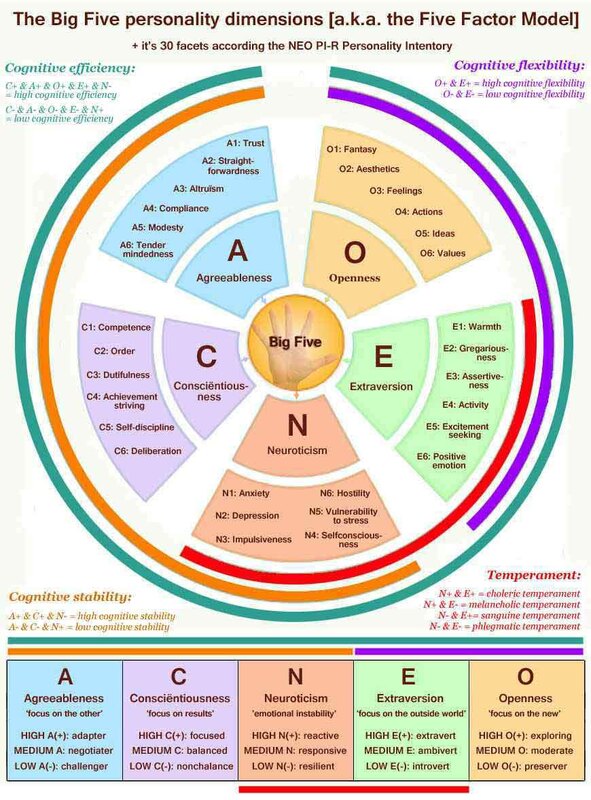 How to assess the Big Five personality dimension 'Extraversion' from the hand? 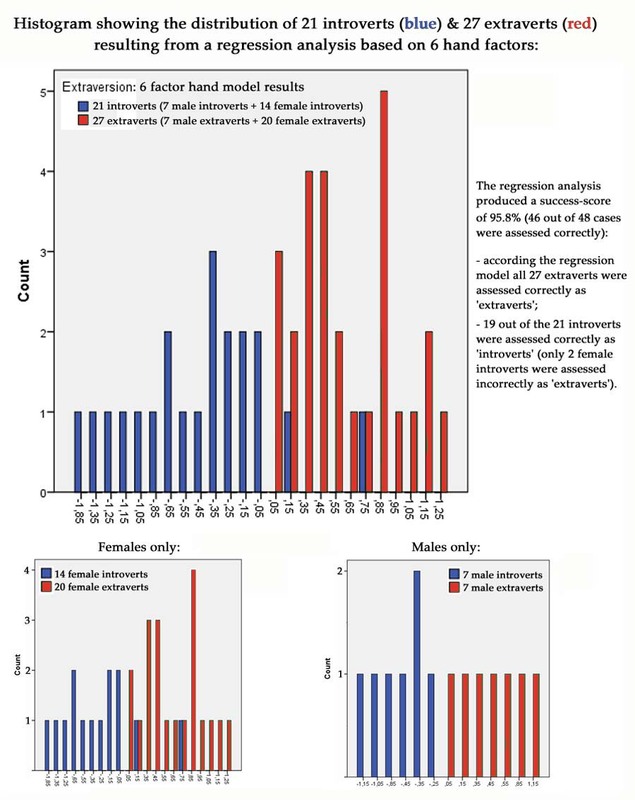 During the past 2 years I have presented various research-updates for my study focussed on how to assess 'Extraversion' from the hand (previous updates have been described inside this preceeding topic ). A new update (march 2014) is persented here, and this topic has been created basically to induce a fresh discussion about the astonishing results, e.g. 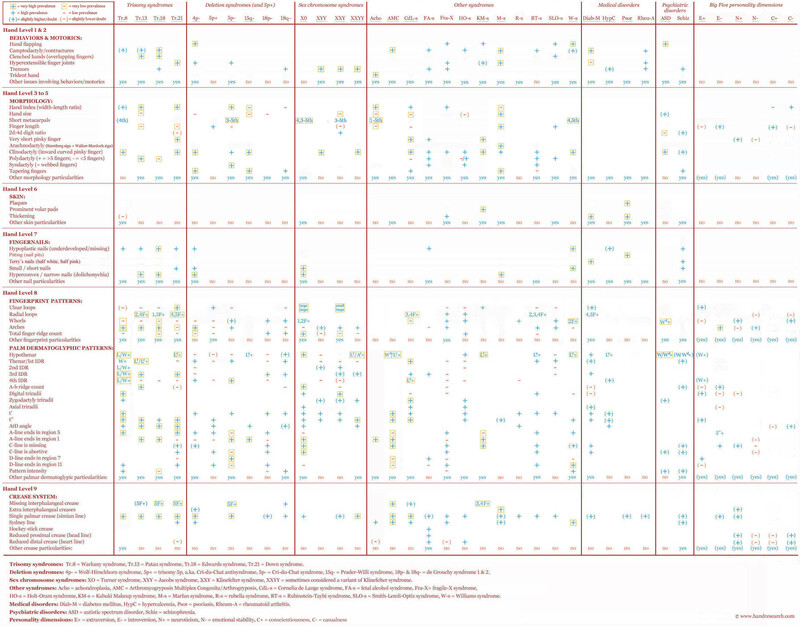 featured with a brand new 'Extraversion Hand Chart' which represents 6 'vertical' hand factors that have produced a success-score of 95.8% in a sample of 27 extraverts + 21 introverts! F = hypothenar vs. thenar ratio [w = 8%]. NOTICE: W = indicative weight for the individual hand factor; the 6 factors together make a weight of 100%; interestingly, on top of the 'vertical' aspects the weights suggest that the hand factors associated with the distal-part of the hand (fingers + upper palm) have more weight than the hand factors associated with the proximal-part of the hand!" 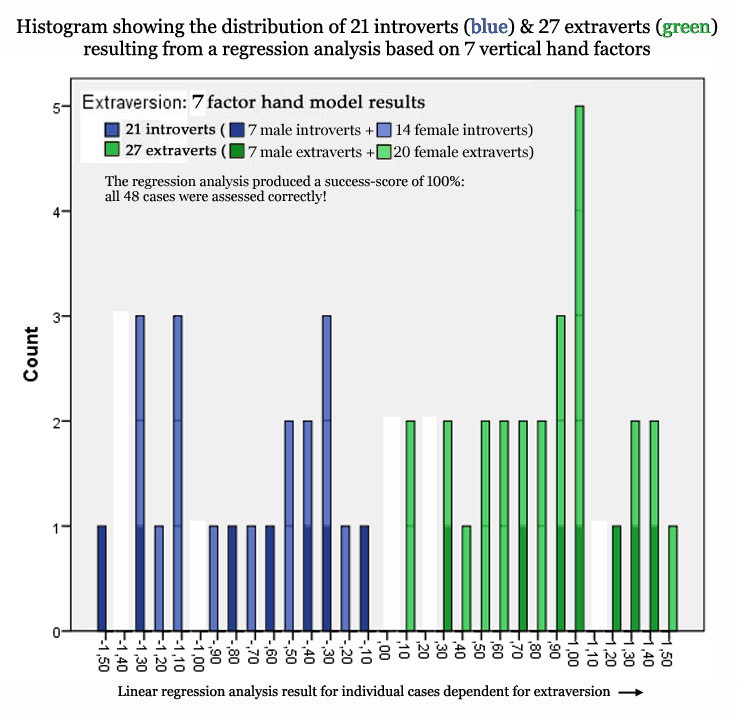 Re: BIG FIVE: hand signs in Extraversion vs. Introversion! Though the term 'extraversion' is commonly used to describe behavior in daily language, in the Big Five model it is described to represent of the five major dimensions of personality. The picture below describes e.g. 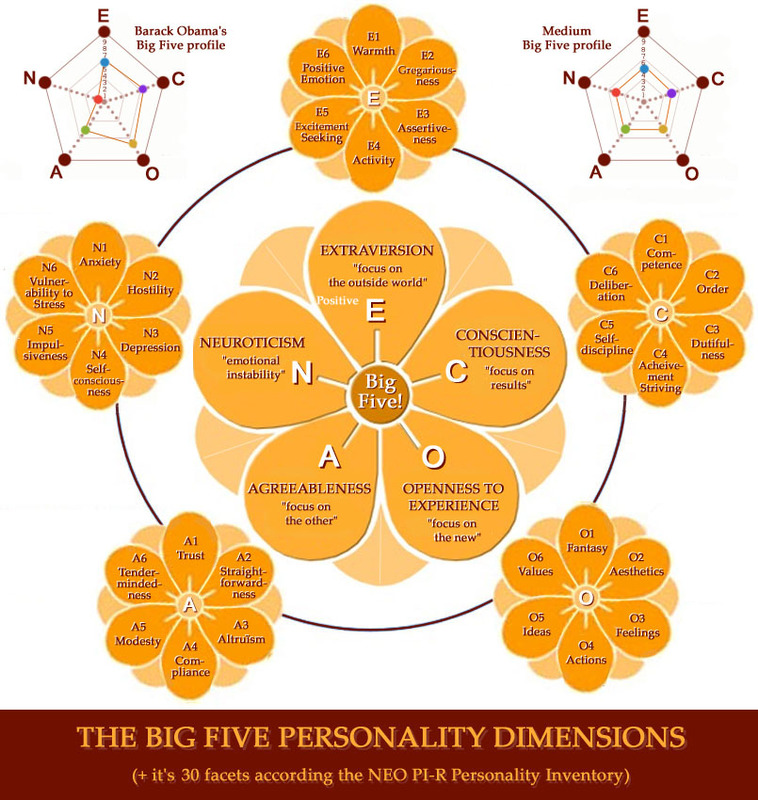 the 6 underlying facets of the Big Five dimension Extraversion, including: warmth, gregariousness, assertiveness, activity, excitement seeking & positive emotion - which together represent the buildingstones for this dimension. 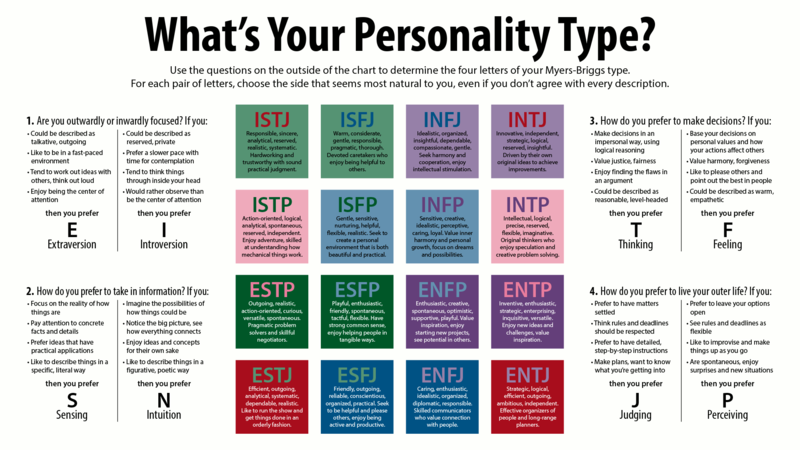 I can now also substantiate this with elements from the Myers-Briggs personality system, because it actually provides evidence: the so-called 'INTJ' types (Introversion-iNtuition-Thinking-Judging) represent the stereotype of 'The Independent Thinker'! So, the MBTI model provides fundamental evidence against the hand reading books which (incorrectly) suggest that a 'dissociated head line' may represent a sign for extraversion... especially when these books also support the classic theory that this hand sign also represents a sign of the 'independent thinker'! 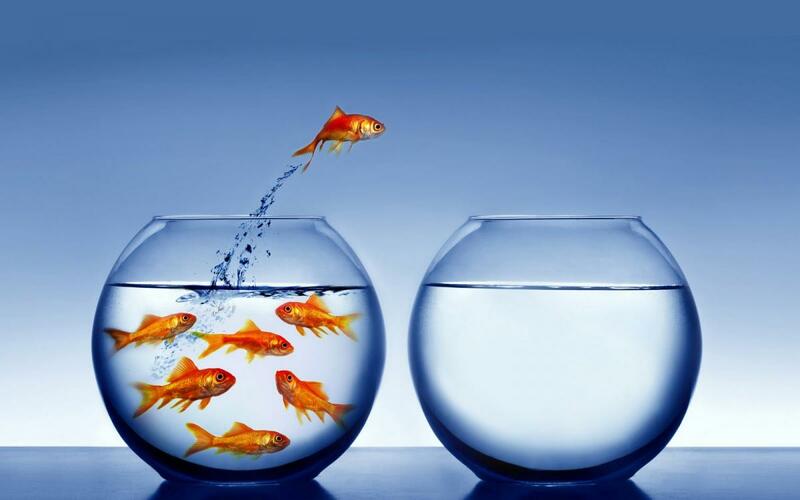 "Quiet Quiz: Are You an Introvert or an Extrovert?" PS. 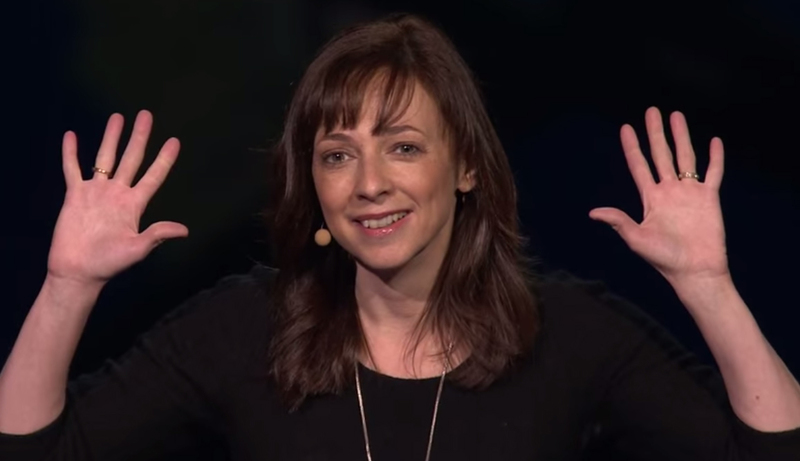 Susan Cain's TEDtalk is presented below, featured with an impression of her hands during the talk. Are there any lessons to be learnt from her palm? She seems to have low 2d:4d ratio, supple thumb, probably water and air mix in hand shape. Well, I have measured her average 2d:4d digit ratio at 0.98 (slightly higher in the right hand than the left hand) - which is actually slightly high. I also observe that the radial side of her hand is more well developed than the ulnar side of the hand. 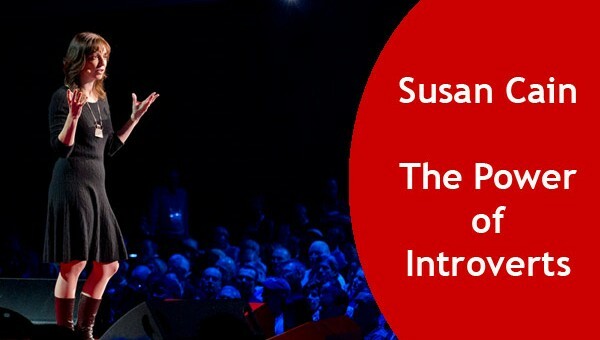 And it appears that she has slightly flat heart lines (which I have spotted in the TEDtalk video). 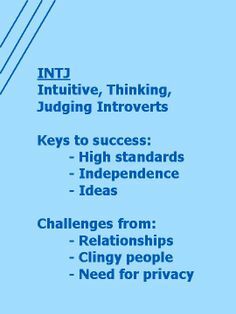 These all represent features that according my study are typical features seen in introverts. Finger length to palm length appears within the range of ordinary. But these are not permanent observations yet, because I have not found other (quality) pictures of her hands. Finger length to palm length appears within the rang of ordinary. By the way, creative people are both Extravert and Introvert, one of their many paradoxical traits. This is based on the study and research of Mihaly Csikszentmihalyi for over 30 years on the psychology of Creative people...."Its a full blast living", as quoted by him. So, they must be having a mixture of both Extroversion and Introversion signs on their palms ? Great illustration!.......it clarifies the signs and creases very well. you are a Creative person, Martijn. You have a natural inclination towards research and data collection, good analytical and writing skills. so, what kind of a Headline do you have? ..... trying to learn about the psychology of Creative minds in general and then relate it with Palmistry, Just the opposite of what palmists do. 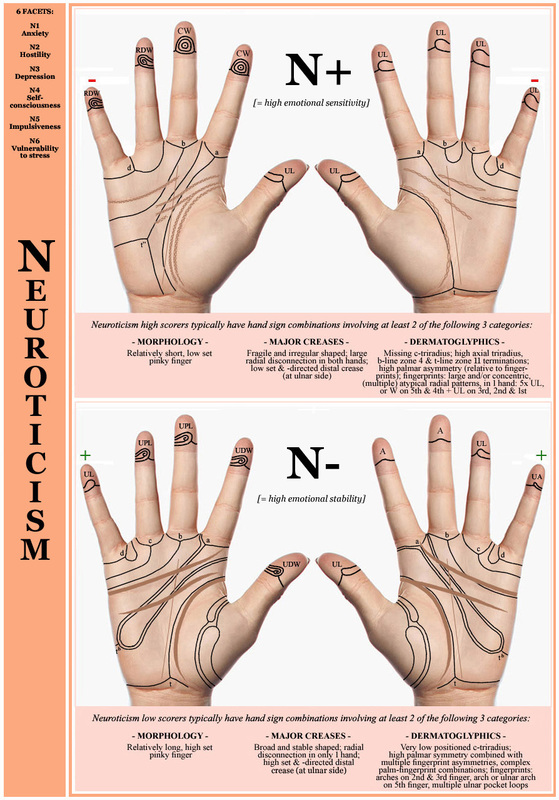 During the past weeks I have managed to find the basics for a brand new hand chart focussed on 'emotional stability' (= low scores on the Big Five dimension Neuroticism), derived from a hand study of 41 low scores + 34 high scorers. Wow!....That would be great which could give us more clarity which is needed NOW! Hi rajashri, thank you for sharing your enthusiasm about this latest development. The new hand chart is now available (see below), and I can now report that I have started working on an article which will describe many more details. Thanks for those nice illustrations. 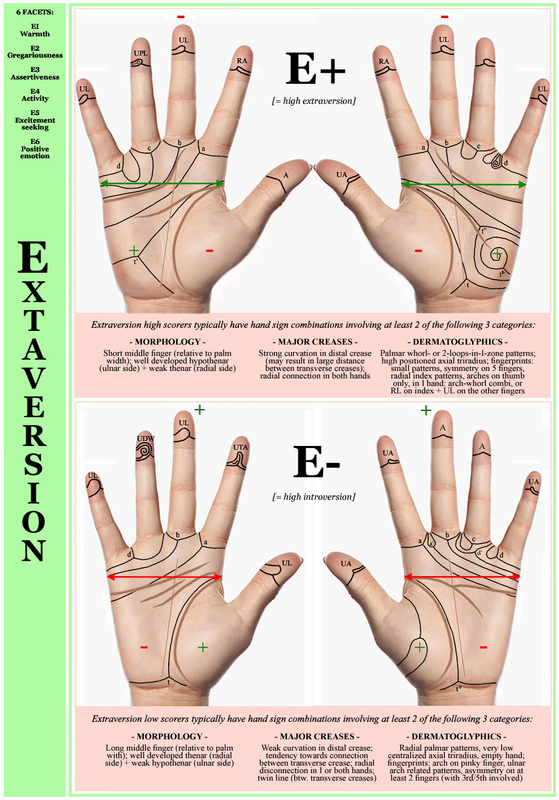 In regards to palmistry theory it seems a bit contradictory with the head line closed to life line for extravert. Interesting to have both perspectives. There could be somewhere an explanation? Clochette2 wrote: Thanks for those nice illustrations. Last year I noticed that there is actually a troublesome issue regarding the palmistry-theory which suggest that 'independent head lines are found in extroverts'... because next to this theory there is also a much more well-known theory which suggests that 'independent head lines are found in independent thinkers'. 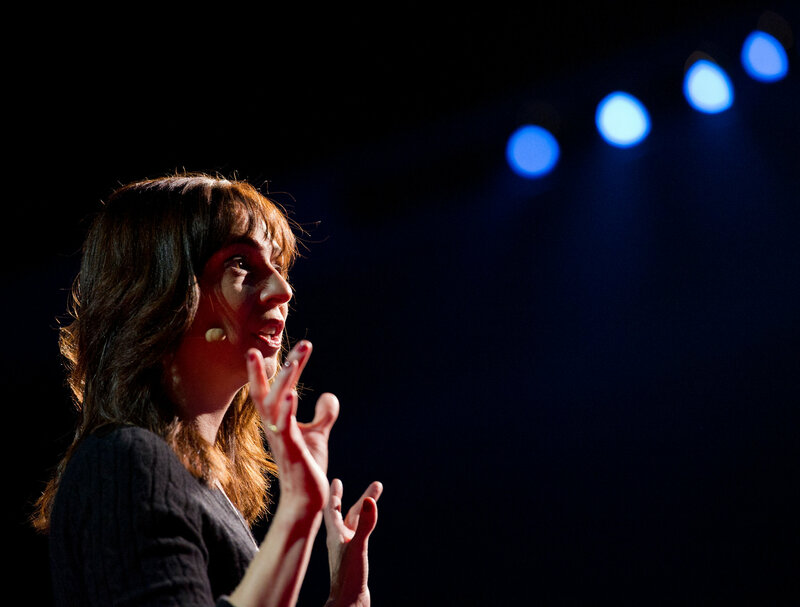 The troublesome aspect here becomes apparent in the perspective of the fact that many studies in the field of scientific psychology have indicated that 'independent thinkers' much more often turn out to be 'introverts' (and far less often 'extraverts')...and thus from a fundamental point of view one of the two palmistry-theories is likely not true! Some palmistry books say that independent head lines are found in actors, singers, politicians, so I think that is where confusion came from for me and maybe other palms readers also. I have seen many hands with independent head lines who are introverts. If independent headline shows independent thinking, then does it mean that head line joined to life line shows non-independent thinking? Yes learner, according simple logics I think that's indeed what that classic palmistry-theory suggests. It is a very interesting "debate". I will take more time to read through your many links and come back. I find it really nice to see your research and compare with palmistry. Even in palmistry theories they can contradict with meanings and this can be confusing. I noticed that contradiction with people who look like extraverted but their head and life lines are joined until the index-medium finger . It led me to think it could be an evolution of personality? But they worked on it, and they have sometimes even become loud people. ..
Just an assumption from their feedback. - Hand level 5: (slightly) short fingers relative to palm width bare potential to become significant. 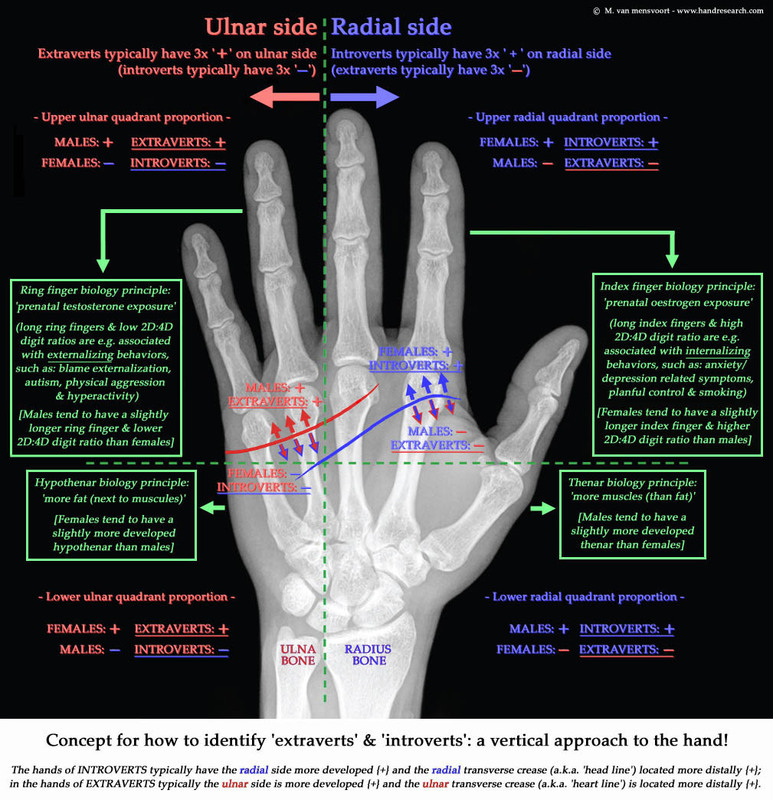 - Hand level 8: combinations involving the following dermatoglyphic features bare potential to become significant: large long loop or whorl in the 4th IDR, whorl on the hypothenar zone, high amount of digital triradii, high amount of (small) ulnar loops, low a-b ridge count, and/or high positioned axial triradius. - Hand level 5: (slightly) long fingers relative to palm width bare potential to become significant. 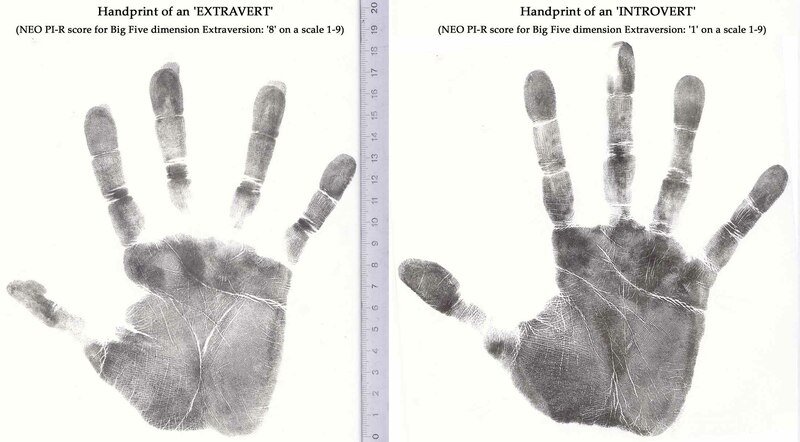 - Hand level 8: the combination of fingerprints & palm quite often displays a low total amount of triradii; it appears that combinations involving: (non-radial) arch fingerprints, missing of a c-triradius, total amount of interdigital triradii of just 3, and/or a missing- or very low positioned axial triradius, represent a typical dermatoglyphic constellation. 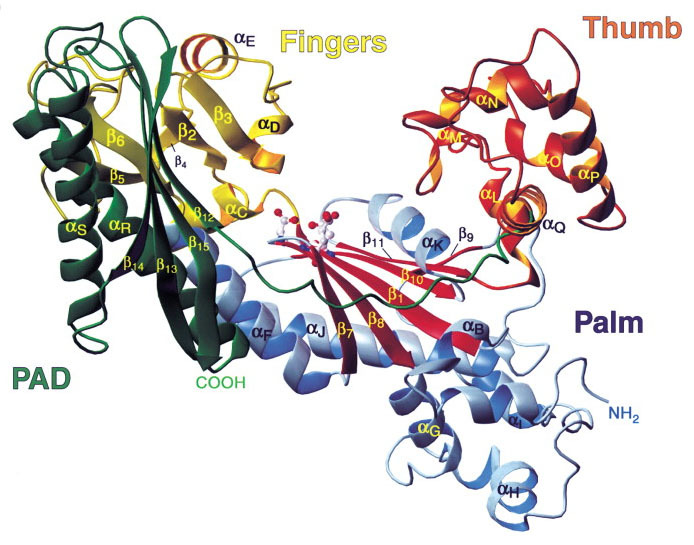 A high a-b ridge count and a relatively high termination of the A-line represent other dermatoglyphic features that bare likewise potential to become significant. - Hand level 9: a flat heart line or a constellation similar to a bridged simian line also bare potential to be significant."